Health and scientific laboratories in the Kurdistan Region of Iraq (KRI) face many challenges in improving laboratory safety and security. Preliminary data from an assessment of KRI laboratories, funded by CRDF Global, has revealed gross shortcomings in practices involving chemical security and the safe management of hazardous chemicals. Such shortcomings introduce hazards and dangers not only to the employees of laboratories, but also to the wider public. Chemicals can be used by terrorists and other criminal groups to inflict widespread damage. Recently, the Middle East Research Institute (MERI) initiated a project, funded by CRDF Global’s Chemical Security Program, to convey international best practices for safe and secure chemical management to laboratory personnel in the KRI, and cultivate knowledgeable staff who can train and supervise colleagues on chemical security and safety practices. Under this scheme, MERI delivered an intensive training course between 16-20 July, 2017, for 27 laboratory technicians and scientists working in hospitals under the KRI’s Ministry of Health (MoH). Four expert trainers from KRI’s universities and health institutions delivered the course, providing lectures and practical lessons to enhance the skills and knowledge of the participants on how to prevent the usage of chemicals at health laboratories for terrorist purposes. A brief survey and short interviews with participants indicated that laboratories in the KRI are at high risk of the theft and malicious use of chemical hazards. In addition to being outdated and poorly maintained, laboratories in the KRI need to be made more secure and less accessible to random users. Chemical substances are not accurately labelled and inventories are not always kept, and where they are kept they are not up to date. 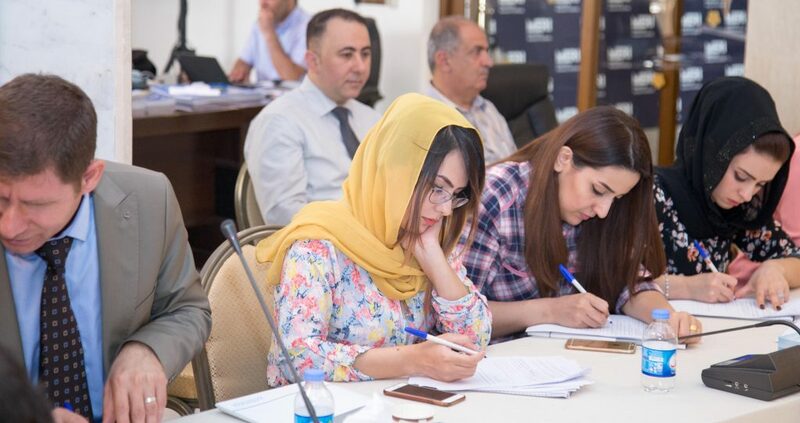 Participants in this course expressed concerns that these shortcomings could result in significant security threats, and therefore recommended a series of steps to address these hazards. Starting a dialogue between the Government and the Kurdistan Parliament to introduce legislation that addresses chemical security concerns within KRI institutions, including hospital and university laboratories, and those in the private sector. Introducing international best practices into the policies and procedures in the public and private sector where hazardous chemicals are handled. Raising awareness among professionals, government officials and the wider public about the importance of securing hazardous chemicals and introducing universal best practices. Raising more funds to improve chemical security at laboratories by introducing new infrastructure and updating existing facilities in all institutions that handle hazardous chemicals. MERI acknowledges the help of the KRI’s MoH for their cooperation, and CRDF Global for their sponsorship. Founded in 1995, CRDF Global is an independent non-profit organisation that promotes international scientific and technical collaboration through grants, technical resources, training, and services. Based in Arlington, Virginia with offices in the Eurasia and MENA regions, CRDF Global works with more than 40 countries in the Middle East, North Africa, Eurasia, and Asia.